We all will passionately draw out a list of New Year Resolutions for 2019 and attempt to stick to them. Well at least for a month (or a week?). And more often than not, the list is topped with Getting Fit. It’s true that most of us find it difficult to devote time to our fitness regime or lose the motivation to keep it going and off goes the ‘New Year New Me’ by the time its February. Being surrounded by fitness enthusiasts all the time has made me aware and interested about how important it is to take care of your health, so I curated this list for anyone who is looking forward to a healthier 2019. Losing or gaining weight, or bettering your posture or just climbing that flight of stairs to your office without looking like a panting hungry wolf. Whatever fitness goals you have for yourselves for 2019, let technology assist you! So I bring to you the best apps not just for great workouts but yoga, diet plan too, for you to stay on track aboard this journey to a healthy you. This app makes tracking food fast and easy. With a food database of over 6 million entries, it is a comprehensive all nutrient tracker. 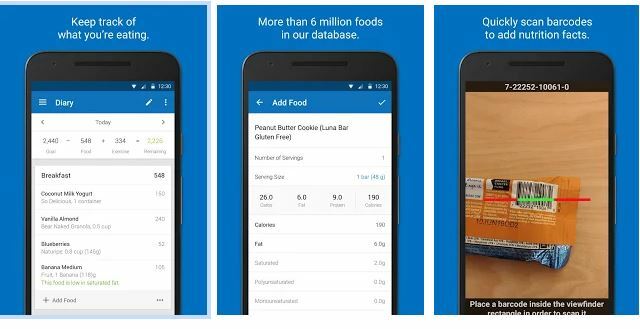 Other features of this cool app include a Barcode scanner (for logging in foods you eat), recipe importer, calorie counter and give great food insights to enable you to make healthy choices. It has an exercise section to allow you to log in your activities. You can choose to join their community for motivation as well and share and celebrate your progress. This app asks you to enter your profile details and the weight goal you want. It then calculates your calorie budget. The user can track his/her weight, food and activities to be on track all year round. One cool feature I loved about this app was that it has a Snap-It feature which allows you to log in a food item by uploading its picture. How easy! There are challenges you can join, or make your own. Honorable mention to Lifesum, MyPlate Calorie Tracker and Fooducate. 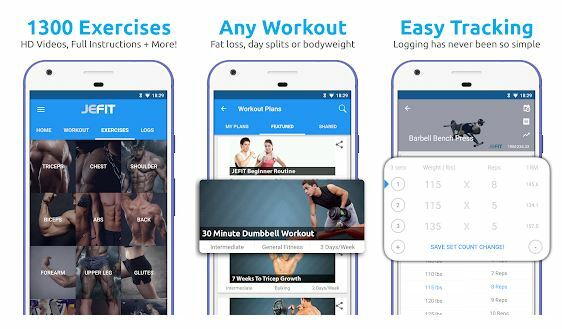 One can use Fitness Buddy for workout goals like bodybuilding, beach body work out, summer body, six pack, belly fat reduction, abs, stronglift or powerlifting. Fitness Buddy provides exercises (bench press, squat, deadlift) with proper form; it can be used while working out in gyms. There is a special body metric tracking section. Its options are great when you are paying. This is an app that allows you to get fit anytime anywhere, you are just getting started or a seasoned athlete. 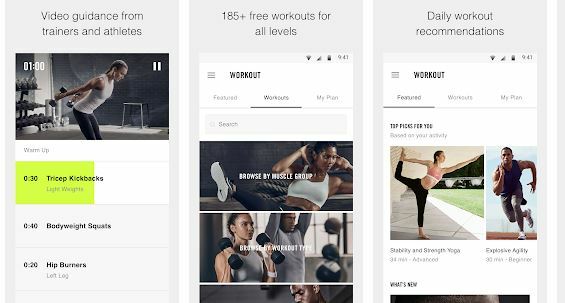 With more than 185 free workouts from strength and endurance to mobility and yoga — featuring our world-class Nike Master Trainers in every drill, this app offers enough for no cost. 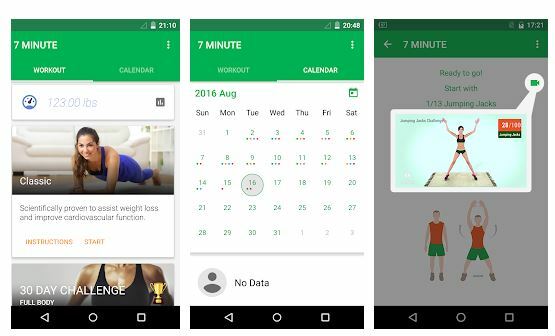 The app customizes the training according to your progress and schedule. You can get motivated by some of your favorite athletes like Michael Jordan, Serena Williams with their inspired workouts. 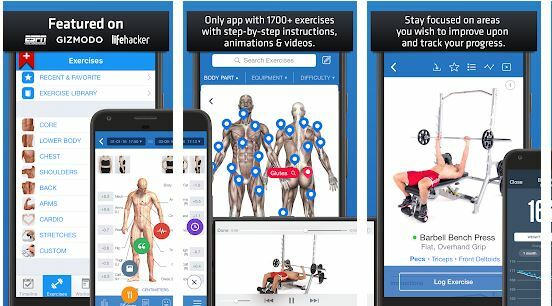 This app provides a free fitness program database to help you stay fit, make progress and get the most out of your gym or home fitness sessions. It is useful for beginners and advanced lifters alike and has over 1300 demonstrations. Besides tracking your exercise routine it lets you set goals, add friends and keeps you motivated with rewards. It is accessible from the web too. Its training programmes are for fully customizable and easy to track through the intuitive tools built in the app. A lot of us are not looking to become heavyweight champions but only wishing to lose that extra flab and increase muscle strength. 7 Minute Workout assists in just that. It is scientifically proven to assist weight loss and improve cardiovascular function. The app consists of only 12 exercises to be done for 30 seconds, with 10-second breaks between each exercise. You don’t even need any equipment need, just a chair, and a wall. Its features such as the voice guidance and adjustable circuit time make this app a lifesaver for people with tight schedules. The app developers have clearly done a good job with the clean user interface. 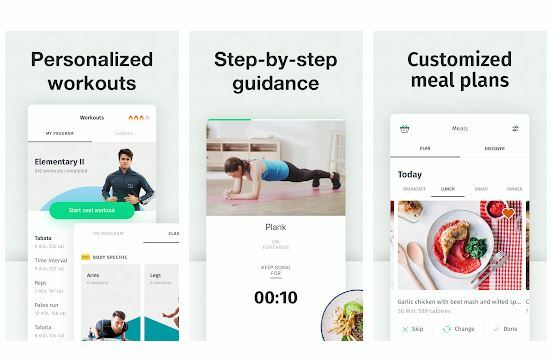 This app offers work-outs as well as a meal plan. You don’t need a gym or even any equipment to work out. It asks to use your own body weight to build muscle strength, increase endurance, improve cardiovascular fitness and lose weight without catabolizing hard earned muscles. And these take only 5-20 minutes. The meal plans are also personalized according to you. It acts as a lifestyle coach to create your healthy habits. What’s better than going for a run to replenish your mind and body? Knowing that you are contributing your bit towards a charity with it. Yes, Charity Miles does that. For every mile you run, walk or bike with Charity Mile, a donation is made to a charity in need on your behalf. 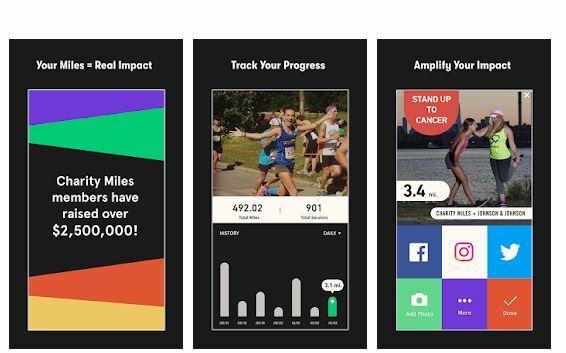 So instead of just running, you could use this app and contribute. Its free and has seen contributions of over $ 2.5 Million. Yoga is a wholesome system promoting well being of the mind and the body. 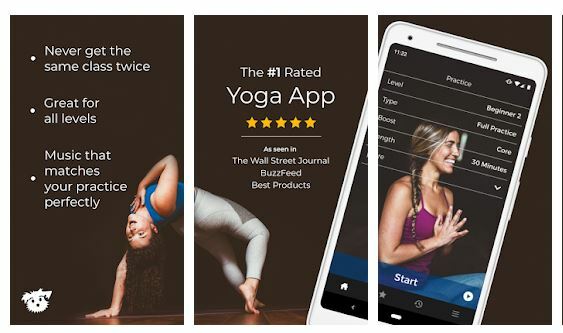 If you are a yoga person or do not where to begin your Yoga journey, these apps are the best in the scene right now. This app is recognized as the best by leading platforms. With over 30,000 different configurations, Down Dog gives you the power to build a yoga practice you love! Unlike other apps, it does not make you follow pre-recorded videos so you won’t do the same workout over and over again. 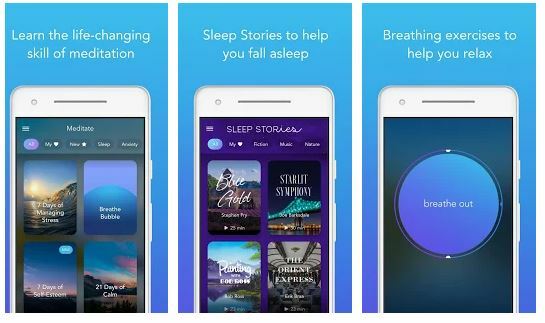 This app plays music that rises and falls with your breathing. A lot of its features are free which guarantee a great experience. Simply Yoga is great for anyone whether a pro or a beginner. 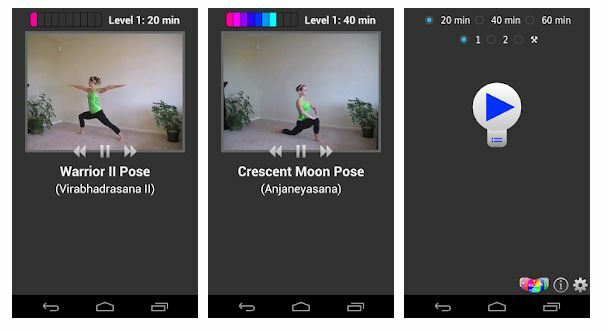 The app contains a 20, 40 and 60-minute yoga routine that steps you through each pose. Each pose is demonstrated by a certified personal trainer, so simply choose your workout length and follow along in the comfort of your own home. There are video demonstrations showing how to get into each pose and audio instructions for the entire routine. Its simple-to-use with no noise or clutter build makes it a preferred app for many. If your fitness regimen is neglecting the mental aspect, it is not complete. 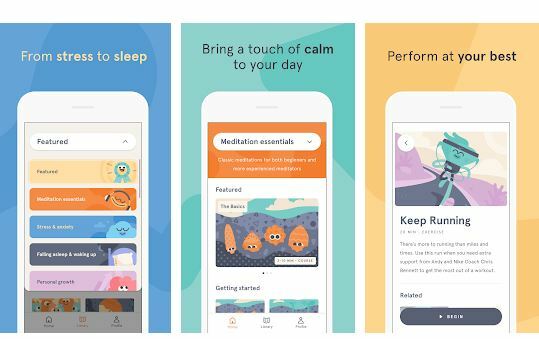 There are many apps these days to help manage stress, sleep better and calm anxiety. The best ones are listed below. It is being used by millions for a restful sleep and managing stress all over the world and is even recommended by psychologists. Its guided meditation sessions are available in lengths of 3, 5, 10, 15, 20 or 25 minutes so you can choose the perfect length to fit with your schedule. Apart from these, there are Stories, breathing programs, masterclasses, and relaxing music to help with issues like lack of focus and concentration, mindlessness etc. This app has been almost everywhere. After seeing its ad on a Youtube Video I was watching, I decided to use it. And the results are pretty well for a user who is not paying. There are exercises on everything from managing anxiety and stress relief to breathing, happiness, calm and focus. They also have specially-designed sleep meditations. It offers push notifications that remind you to be in the present and breathe. Let’s conquer 2019 with a fitter you!